Commenced in the year of 2001 in the heart of Hyderabad, Cootera.com has successfully created a niche for themselves by administering a service oriented platform which endeavors to bridge the gap between advertisers and browsers, by offering search services to enable the audiences to discover and browse through classified advertisements online, while assisting enterprises and individual sellers to reach prospects, converting those potentials to customers and then retaining those customers eventually. Cootera.com is the ideal online portal for an assorted range of products and services to be sold by companies and individual sellers like, electronics, automobiles, fitness and sports, services of all kind, clothing and accessories, furniture and furnishings, art and antiques, pets and pet products, employment information, travel and transport and real estate, which is categorized regionally for the customers benefit. This free classified site is ideal for sellers to put up advertisements about their used items - ranging from used cars to mobiles, furniture, laptops, clothing and more and buyers can purchase them at reasonable prices promptly. The team members of Cootera.com are highly dedicated towards their work and aspire to render a safe and satisfied online experience to the users, by not only protecting the privacy of the consumers but also providing an up-to-date technology service. 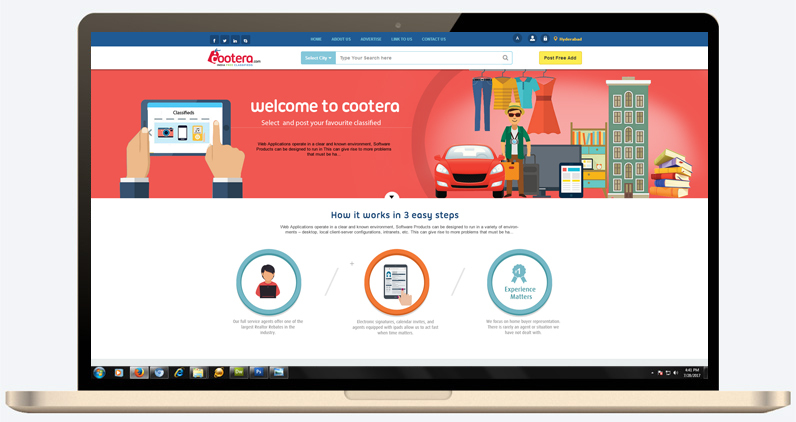 Every member of Cootera.com is customer-oriented and ensures that every requirement is met in a prompt and professional way. This company is acknowledged for providing a strong base for validated and scrutinized sellers, so that consumers are not misused by fraudulent activities.